Pinpoint Market Research reports that “twenty-somethings” want something more from brands than just a product or service; they want social, political and community action. The market research company surveyed 1,650 men and women aged twenty to twenty-nine in the U.S. about social issues and brand engagement. 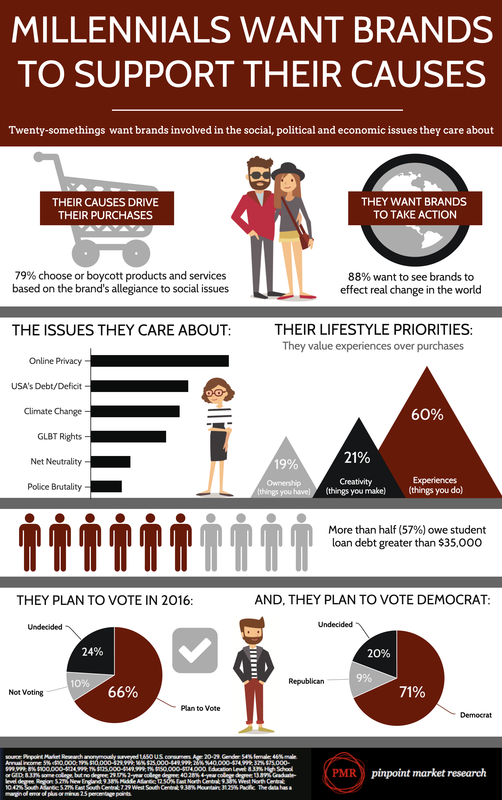 The study shows that U.S. consumers age 20-29 want brands involved in the social, political & economic issues they care about. Pinpoint Market Research anonymously surveyed 1,650 U.S. consumers. Age: 20-29. Gender: 54% female; 46% male. Annual income: 5% <$10,000; 19% $10,000-$29,999; 16% $25,000-$49,999; 26% %40,000-$74,999; 32% $75,000-$99,999; 8% $100,000-$124,999; 1% $125,000-$149,999; 1% $150,000-$174,000. Education Level: 8.33% High School or GED; 8.33% some college, but no degree; 29.17% 2-year college degree; 40.28% 4-year college degree; 13.89% Graduate-level degree. Region: 5.21% New England; 9.38% Middle Atlantic; 12.50% East North Central; 9.38% West North Central; 10.42% South Atlantic; 5.21% East South Central; 7.29 West South Central; 9.38% Mountain; 31.25% Pacific. The data has a margin of error of plus or minus 2.5 percentage points. Very interesting! The commitment to social causes is impressive. Great in formation.